On Afro Celts, Gaelic indigeneity, the diaspora, Hip-Hop, and more. Griogair Labhruidh has now established himself firmly not only as an advocate of Scottish Gaelic tradition – most especially in the form of song and music – but also as a bold experimenter infusing Gaelic musical forms with global styles and themes, now as a member of the new lineup of the Afro Celt Sound System whose new album has shot immediately to the number 1 slot of Amazon’s World Music chart. (1) Can you tell us a little about your family and background, and how Gaelic language and music fit into that picture? I was brought up in Gart a’ Chàirn by Loch Loimeann (Loch Lomond), which is in the Leamhanachd, an area more associated with mainstream Central Scotland than its own original local traditions. These traditions have been of great interest to me, including the now extinct Loch Lomond dialect of Gaelic along with the volumes worth of Gaelic folklore, songs and music collected from the area. Loch Lomond aside, both sides of my family belong to other parts of the country and I feel a strong connection with my heritage through their roots. My mother’s family are descendants of ancient Scottish kings, the Clann Fhiachar, and come from the centre of the ancient kingdom of Dail-Riata: Cille Mhartainn in Earra-Ghàidheal (Argyll). This area is similar in its nature culturally to Loch Lomond in that it has lost its language and culture over the past centuries through colonisation. My mum’s people also have ties with An t-Eilean Sgitheanach which is largely English-speaking now. However, the area I have connections with, Stafainn, is in my eyes, the last region where Gaelic is still a massive organic part of a community out-with the outer Hebrides. Despite all of this variance in heritage, it is on my father’s side that local influences are apparent in the way I speak Gaelic, perform traditional music and represent my culture and in a sense this was a conscious decision from a young age influenced greatly by my father and his brother who are both pipers and tradition-bearers in their own right. It was from my father’s brother Colin that I found my love for both my ancestry, culture and belonging to Baile Chaolais, which lies on the banks of Loch Lìobhann, one of the border waters between Loch Abar and Earra-Ghàidheal. (2) What motivated you personally to engage so deeply not only with Gaelic music but culture, tradition and history? How has that engagement changed your perception of Gaeldom, Scotland and the world? My father’s side of the family were renowned musicians, particularly my grandfather’s cousin Uilleam Labhruidh, who was one of the most celebrated pipers in Scotland of his day (1882-1916) and who before his untimely death in the Great War, penned tunes which spread all over the globe from Donegal to Ceap Breatann. On that side I am Griogair ’ic Ghòrdain ’ic Iain ’ic Sheumais ’ic Uilleam ’ic Thòmais ’ic Uilleim and although I can trace my ancestry back to the same degree on each side, I feel closest to that side because I am a Labhrach myself and have ties to some of the biggest characters in the history of the area! It was these ancestors, their music and the great folk legends of my people that inspired a strong sense of Gaelic identity in me. One strong enough to make the culture and language my life focus. When I started engaging with the Gaelic tradition I met many stalwarts who became mentors for me throughout the Highlands and Islands. I will give particular mention to both Ailean Dòmhnallach of Gleann Ùige, Mùideart and Tormod Mac’illEathain of Uibhist/Glaschu from whom I was given the keys to the doors of tradition many learners of the Gaelic language and native speakers will unfortunately never be able to open due to how one relates oneself to the music and sound of our people and our history. Tormod was my touchstone in my road to becoming a bard and although we are out of touch at the moment I will be eternally grateful for his guidance and friendship. I am also eternally indebted to Calum Eardsaidh Choinnich of Uibhist a Deas who gave me the feel for how recited Gaelic poetry is meant to sound in its purest form. (3) It looks to me as though you started out your musical career on a pretty straight-forward, traditional path but before long you began to experiment with global music styles and are now creating exciting new hybrid Gaelic musical forms. How and why did you change course, as it were? I describe myself as having two sides: the traditional side which is that of a sean-nòs singer, piper, poet and storyteller; performing a wide range of purist traditional Scottish Gaelic material in its rawest most uncolonised form. The other side is that of a jazz fanatic who compares the Highland piping traditions of ceòl mór to the modal Jazz of John Coltrane, McCoy Tyner and co., who sees the long drawn out recited complex metres Gaelic poetry he heard being recited so rhythmically from some of the older generation as a sister tradition of rap and Hip Hop. I can describe some of my current solo project, whatever becomes of it as the meeting point between certain types of Jazz-orientated Hip Hop music and the music of the Gael. In the raps I take the rhymes and rhythmic structures which I have studied in the most ancient of our Gaelic poetry (including that of Oisinn himself who tradition tells came from near Baile Chaolais) and present them with the kind of beats and Hip Hop backing I enjoy mixed with a bit of ceòl Gàidhealach. My work with Afro Celt Sound System is a natural progression from what I have been working on as a solo artist. African and Punjabi music are both connected to Gaelic music – I’m certainly not the first person to have said that. For a while I was the kind of purist who believed that putting beats or even accompaniment of any kind to our tradition was somehow alien because the poetry and music has its own internal rhythm, but I have since realised that it is the kind of rhythms we apply that determine whether the natural flow of the music is denatured or not. When the language meets the ‘folk’ context it usually changes the nature of the music to be more Westernised or more European whereas some recited poetic styles of rap and Hip Hop beats, as well as African beats, etc., tend to bring the poetry straight back to its roots and give it strength and lift. The music is in the language. Most of the melodies and styles of sean-nós we have are relatively new when compared with the recited styles I encountered when studying the performances of our most ancient music: the aural poetry of Oisinn. When I refer to the poetry of Oisinn I do not mean the reshaped invented traditions associated with James Macpherson, but the thousands of lines of aural poetry which were collected in Scotland that we believe to be the actual words of the ancient poet himself. (4) Your use of names like “Ghetto Croft” seems to be a pretty clever engagement not just with modern Hip-hop culture but also the claims (made by anglophones) that Gaels live in some kind of a ghetto. Is your new musical path and identity part of a particular cultural alignment or political statement? How do you hope that such efforts might benefit Gaeldom? In non-colonised West Africa they have the tradition of the Griot who as well as being a musician and poet, is able to recite people’s ancestry to them and tell stories, sing songs of someone’s forebears to give them a sense of dùthchas. In the writing down of our traditions our filidh, bàird, griot, or whatever you want to call them, lost their place in society and this, coupled with Britain’s dismantling of our traditional communities, killed off our very own Gaelic rap which has existed for thousands of years. In Ireland there is the tradition of the crosán (razorbill), the trickster, who unlike the filidh was able to write scathing satire rather than just praise poetry for his chief and in Baile Chaolais alone he was known as the gille-ghoillidh. Nowadays words like amadan, gill-onfhaidh and glaoic have become derogatory terms but I believe at one time they were titles for different types of poets or performers. This is all a part of the colonisation of our people and for a while I chose one of those names as my MC name but later decided it was too difficult for non-Gaels to read! “GhettoCroft” is a working title and in all honesty it was originally intended as a satyrical bash at just the things you have mentioned. Whether people pick up on it or not is anybody’s guess but satire plays a big part in our culture and of course anyone who studies my bàrdachd will realise just who it is I am having a dig at both within and out-with Gaelic culture. In one of my satyrical rhymes I make mention of Rupert Murdoch, ‘Mac Mhuirich’s’ agenda filled media and also discuss how the Gaelic branch of the BBC shouldn’t become the principle ‘standard bearers’ of their own people, or of the truth. There is a coded theme/word play within the rhyme which is related to the Clann Ghriogair, Murdoch’s surname and my ideas on the media. Satire of this sort is all good fun – and deeply rooted in tradition. (5) Besides being an amazing artist on a global stage, you also actually run a croft in the Highlands and have revived some cool, old Gaelic traditions, like Beltane fires. What do such customs mean to you and your sense of place in Scotland? Why might the revitalisation of such traditions be important today to you and others? As well as enriching the mundane life experience of the day to day, many indigenous rituals actually come from the land and the way we worked it. Perhaps lack of ritual has a lot to answer for in the way we treat ourselves, our planet and all the non-human sacred beings upon it. Several years ago I chanced upon two people who have remained very good friends: Clarence, who is a Native American from North California, and his wife Deborah. In meeting Clarence I immediately realised one of my life dreams: to make a true organic connection with a real shaman who is completely at one with his peoples’ traditions and in doing so connected the dots with what I had studied of our own traditions (particularly those of pre-Christian origin). They both came and stayed in Ballachulish for some nights and as part of their visit Clarence performed a ‘child healing ceremony’ on the croft. For me, ever since then the incantations, rituals, blessings and beliefs of our ancestors have become not only something to be studied through the anthropological microscope by academics, but a way of life: a way of reaching ancestral spirits and connecting with the sacred earth. I also happen to love Highland cattle, probably due to my life long obsession with the drovers, the stories of Gaelic heroism connected to cattle/cattle raiding and particularly the character of my relative, Rob Ruadh MacGhriogair. (6) What are your thoughts about Gaeldom as a cultural entity or force beyond Scotland? How do you think that North Americans of Highland ancestry can effectively participate in or celebrate their Gaelic heritage? Do you hope to engage such a diasporic audience? How or why do you think a North American audience might benefit from exploring and participating in their Gaelic heritage? I have no real premonitions or expectations as to what my engagement with the diaspora in the future may be, only that upon my journey I wish to do what I can to gain exposure for my culture not only amongst circles of those who are already engaged but with those who have little to no knowledge at all. One often finds that those who are already engaged are too entrenched in their own version of tradition to empathise with where I am coming from. Therefore it would be nice to think that I could turn one or two heads (particularly those of the Gaelic diaspora’s youth) towards the culture both at home and abroad. What I have done musically over the past few years may or may not make that a reality. 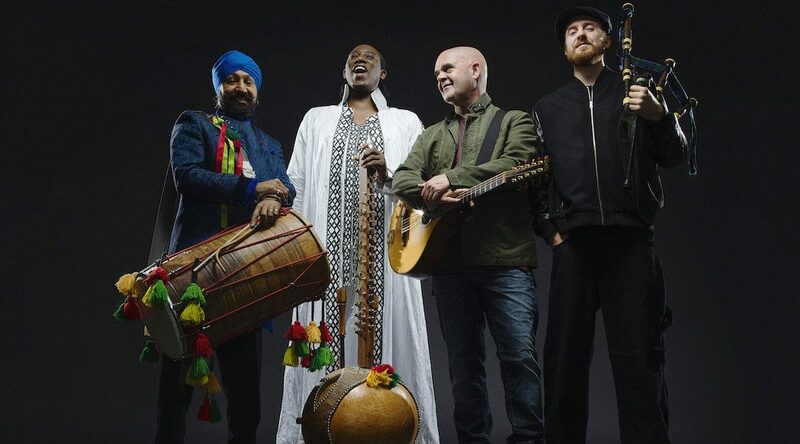 Afro Celt Sound System will be touring in America next year and I have to admit I am excited about the prospect but I have no idea what kind of connection we may or may not make with either the African or Gaelic diaspora over there. The Source, our new album which just got the number one spot in the World Music charts, is hopefully just the start of a beautiful journey along with my brothers and sisters who all make up Afro Celt Sound System into a further exploration of where I can take my music and language. Simon Emmerson has brought together (along with most of the long term members of the band) a plethora of talent which goes way beyond myself and the other three core members. My interaction with African/Punjabi tradition is yet to come to its full fruition and hopefully, with Simon who since meeting me has become deeply engaged with Scottish Gaelic culture at the helm, we can continue to grow and interact between our traditions for many years to come! As far as Gaelic Hip Hop goes, let’s just say I have a few ideas up my sleeve that may or may not be over the heads of people who have not studied both Hip Hop and Gaelic culture. I hope I find an audience for it because I have so much fun making it. I’d still be happy if I ended up singing songs and rearing cattle here at the croft without a worldwide highly engaged culturally and politically motivated audience for my music and language. But everyone wants to be heard to some degree and I believe, as do all the musicians I work with, that in the time we live in it is our duty not only to voice my own ideas but more importantly, those of the ancestors. This interview was conducted by Michael Newton and first published on Urras Gàidhlig nan Stàitean Aonaichte / GaelicUSA – with thanks. Buy the new album The Source here. Well done Griogair, and well earned — the rise of your recent Afro Celt album to the top of the Amazon charts. I have been listening to this excerpt from Bruce 700 incessantly just lately. What a solo, what a voice and what a great composition! Even better 2nd time, what a treat!